WASHINGTON (CNN) -- The United States Mint launched a new coin Tuesday featuring jazz legend Duke Ellington, making him the first African-American to appear by himself on a circulating U.S. coin. 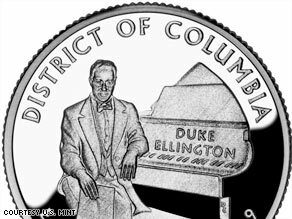 The District of Columbia coin honoring Duke Ellington was introduced Tuesday in Washington. Ellington, the composer of classics including "It Don't Mean a Thing If It Ain't Got That Swing" appears on the "tails" side of the new D.C. quarter. George Washington is on the "heads" side, as is usual with U.S. quarters. The coin was issued to celebrate Ellington's birthplace, the District of Columbia. U.S. Mint Director Ed Moy introduced the new coin at a news conference Tuesday at the Smithsonian Institution's National Museum of American History. Members of Ellington's family were present at the ceremony, and the jazz band of Duke Ellington High School performed. Ellington won the honor by a vote of D.C. residents, beating out abolitionist Frederick Douglass and astronomer Benjamin Banneker. Also on the coin is the phrase "Justice for all." The Mint rejected the first inscription choice of D.C. voters, which was "taxation without representation," in protest of the district's lack of voting representation in Congress. Edward Kennedy "Duke" Ellington received 13 Grammy Awards and a Pulitzer Prize, among numerous other honors. His orchestra's theme song, "Take the A Train," is one of the best-known compositions in jazz. Ellington was born in the district in 1899 and composed more than 3,000 songs, including "Satin Doll," "Perdido" and "Don't Get Around Much Any More." "It Don't Mean a Thing If It Ain't Got That Swing" helped usher in the swing era of jazz. Ellington performed with other famous artists, including John Coltrane, Louis Armstrong and Ella Fitzgerald, and he traveled around the world with his orchestras. He died in 1974 at the age of 75. The first African-American to appear on a circulating coin was York, a slave who accompanied Lewis and Clark on their "Corps of Discovery" adventures across America at the dawn of the 19th century. The 2003 Missouri quarter features the three men together in a canoe on the obverse. The U.S. Mint distinguishes between circulating coins, which are intended for daily use, and commemorative ones, which mark special occasions. African-Americans including Jackie Robinson, who broke baseball's color barrier, have appeared on commemorative coins. Educator Booker T. Washington, botanist George Washington Carver and the first Revolutionary War casualty, Crispus Attucks, all of whom were black, have also appeared on commemorative coins, according to the U.S. Mint.